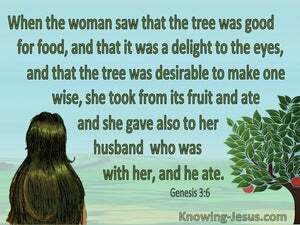 ﻿ Genesis 3:6 When the woman saw that the tree was good for food, and that it was a delight to the eyes, and that the tree was desirable to make one wise, she took from its fruit and ate; and she gave also to her husband with her, and he ate. Then the woman saw that the tree was good for food and delightful to look at, and that it was desirable for obtaining wisdom. 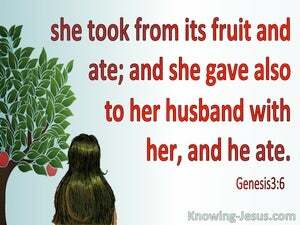 So she took some of its fruit and ate [it]; she also gave [some] to her husband, [who was] with her, and he ate [it]. When the woman saw that the tree produced good food, was attractive in appearance, and was desirable for making one wise, she took some of its fruit and ate it. Then she also gave some to her husband who was with her, and he ate some, too. And when the woman saw that the tree was good for food, and that it was a delight to the eyes, and that the tree was to be desired to make one wise, she took of the fruit thereof, and did eat; and she gave also unto her husband with her, and he did eat. And when the woman saw that the tree was good (suitable, pleasant) for food and that it was delightful to look at, and a tree to be desired in order to make one wise, she took of its fruit and ate; and she gave some also to her husband, and he ate. And when the woman saw that the tree was good for food, and a delight to the eyes, and to be desired to make one wise, she took of its fruit, and gave it to her husband. And the woman saw that the tree was good for food, and that it was a pleasure for the eyes, and the tree was to be desired to give intelligence; and she took of its fruit, and ate, and gave also to her husband with her, and he ate. And when the woman saw that the tree was good for food, and that it was desirable to the eyes, and a tree of covetousness to understand, she took of its fruit and ate and gave also unto her husband with her; and he ate. When the woman saw that the tree [was] good for food and that it [was] a delight to the eyes, and the tree was desirable to make [one] wise, then she took from its fruit and she ate. And she gave [it] also to her husband with her, and he ate. And when the woman saw that the tree was good for food, and that it was pleasing to the eyes, and a tree to be desired to make wise, she took of its fruit, and ate. She also gave to her husband with her, and he ate. And the woman saw that it was a good tree to eat of, and lusty unto the eyes, and a pleasant tree for to make wise. And took of the fruit of it and ate, and gave unto her husband also with her, and he ate. When the woman saw that the tree produced fruit that was good for food, was attractive to the eye, and was desirable for making one wise, she took some of its fruit and ate it. She also gave some of it to her husband who was with her, and he ate it. When the woman saw that the tree was good for food, and that it was a delight to the eyes, and that the tree was to be desired to make one wise, she took of its fruit, and ate; and she gave some to her husband with her, and he ate. And, when the woman saw that the tree was good for food, and that it was desirable to the eyes and the tree was pleasant to make one knowing, then took she of the fruit thereof, and did eat, and she gave to her husband also, along with her, and he did eat. And when the woman saw that the tree was good for food, and that it was pleasant to the eyes, and a tree to be desired to make one wise; she took of its fruit, and ate, and gave also to her husband with her, and he ate. desire, lust, greedily, pleasent, . 5 "For God knows that in the day you eat from it your eyes will be opened, and you will be like God, knowing good and evil." 6 When the woman saw that the tree was good for food, and that it was a delight to the eyes, and that the tree was desirable to make one wise, she took from its fruit and ate; and she gave also to her husband with her, and he ate. 7 Then the eyes of both of them were opened, and they knew that they were naked; and they sewed fig leaves together and made themselves loin coverings. when I saw among the spoil a beautiful mantle from Shinar and two hundred shekels of silver and a bar of gold fifty shekels in weight, then I coveted them and took them; and behold, they are concealed in the earth inside my tent with the silver underneath it." "I have made a covenant with my eyes; How then could I gaze at a virgin? But each one is tempted when he is carried away and enticed by his own lust.